Performers include: Jon Tenney, Rebecca Romijn, Michael O’Keefe, Chris Butler, and Ryan Hurst. This TV series is based on the best-selling books by author David Baldacci. 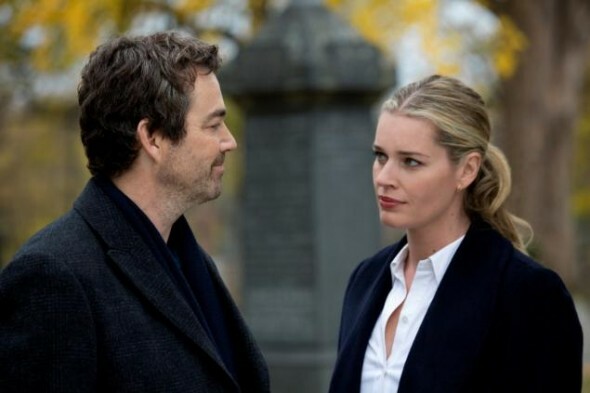 Sean King (Jon Tenney) and Michelle Maxwell (Rebecca Romijn) are unusual private investigators. Both of them used to be Secret Service agents, and their unique skills (not to mention their razor-sharp chemistry) give them a leg up on conventional law enforcement. Maxwell is a former elite athlete who uses her brains, beauty and Beltway connections to solve cases. King’s career in the Secret Service ended when the presidential candidate he was assigned to protect was assassinated, sending him on a downward spiral. Now, King has added a law degree to his arsenal of skills, allowing him to navigate the system in ways that a typical private investigator never could. Along the way, King and Maxwell clash over just about everything — from her garbage-strewn car to his love of wine over beer. FBI Special Agents Rigby (Michael O’Keefe) and Carter (Chris Butler) frequently clash with King and Maxwell over their less-than-legal methods. Rigby is a veteran FBI agent with many years on the force and he always follows the rules, sticks to the facts and questions anyone who stands between him and the truth. Carter is Agent Rigby’s junior partner and will likely go far in the agency. He works with whoever can help solve a case -– either standard law-enforcement organizations, like the police, or unconventional resources, like private investigators. Helping the King and Maxwell team is Edgar Roy (Ryan Hurst). He joined their team after Sean King served as his lawyer during his highly publicized criminal case. Edgar is a high-functioning autistic savant who specializes in patterns and numerical sequences. He has certain work-space requirements, like sitting at a “friendly” desk and enjoying soup for lunch on Mondays. Sean’s investigation of the Ritter assassination threatens to end his partnership with Michelle as she considers returning to the Secret Service. The shocking truth sends Sean back to the scene of the crime to prevent history from repeating itself. First aired: August 12, 2013. What do you think? Do you like the King & Maxwell TV series? Do you think it should have been cancelled or renewed for a second season? King & Maxwell: Cancel or Keep the TNT Series? I loved this show! I want it renewed! So much better than most shows we have on! RENEW! my husband and I truly enjoyed the series… had humor, action, and good story lines. Not sure why it cancelled out as I have not heard any negatives from those we know – 50-60 age range. So much of what is put out on TV is not worth watching the past year. I’m disappointed it ended after only one season. The network obviously does not recognise a winner! Interesting characters, great acting and plots that twist and turn, what more does a network need besides an average of over 3 million viewers? The series should have been renewed. It was a great show!! My husband and I love this tv series . A pity it’s just one season. Perfect choice of stars to play the characters. PLEASE bring King and Maxwell back!!! King and Maxwell was a great show. I hope it is picked up by someone else. It shouldn’t have been cancelled. It was a good show and the novels by David Baldacci were good too. I wish they renewed it for a new season. I liked this show. I thought the show was good enough to keep another season. LOVED THE SHOW ! EVERY CHARACTERISPOT ON …. WHY DO THE GOOD ONES GO… MORE REALITY SHOWS. DON’T COST MUCH. AND WE PAY FOR IT ALL ANYWAY. SOON EVERYONE WILL SCAP T.V…. “HOT DAMN”…GONNA MISS IT ! I liked King and Maxwell. It should have gone another season. Should have been renewed. Much better than most shows on tv! This was a great show!! I really hope they bring it back, all the characters fit so perfectly together. Never boring and loved watching the interaction. I still think about this show to this day!